Innovative multi-purpose 3-in-1 garden tool allows you to rake, shovel, shift and even sieve almost anything in your garden. Amazingly lightweight, with a long reach (1.5M) and a strong powder-coated metal handle, it is designed to make light work of many everyday tasks. Start by raking and scraping debris in to a pile - then turn your Rake ‘N’ Shift over and it becomes a shovel – now you can shift the debris exactly where you want it! When clearing and tidying it also allows you to sieve and shake out gravel, water or top soil - so you only discard and move what you need to! Perfect for leaf collection, dealing with grass cuttings and clippings, removing debris from your driveway, pond or water feature. This innovative multi-purpose 3-in-1 garden tool allows you to rake, shovel, shift and even sieve almost anything in your garden with a minimum of effort and virtually zero bending or backache – all using just one tool! Amazingly lightweight, with a long reach (1.5M) and a strong powder-coated metal handle, it is designed to make light work of many everyday tasks. The incredibly strong and durable polycarbonate head is designed to slide smoothly under debris collecting it all efficiently and thoroughly. Perfect for leaf collection, dealing with grass cuttings and clippings, removing debris from your driveway, pond or water feature – even clearing up after your dog, horse or cat! 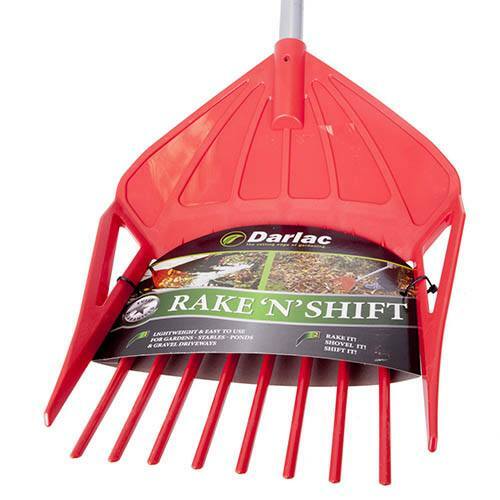 The Rake ‘N’ Shift is THE tool that every gardener must have and will be indispensable all year long! Supplied as one tool with a long reach (1.5M), strong powder-coated metal handle.